London: The Sri Lankan juggernaut crushed West Indies by 57 runs in Friday's lop-sided semifinal to set up a summit clash with Pakistan in the final of the Twenty20 World Cup at Lord's on Sunday. Put into bat, run-machine Tillakaratne Dilshan hit a sublime unbeaten 96 to help the Lankans overcome a mid-innings collapse and post 158 for five. And when they returned to defend the total, Angelo Mathews sent down a sensational first over, claiming three crucial wickets, and West Indies could never really recover from the setbacks. For them, Chris Gayle (63 not out off 50 balls) waged a lonely battle but none of his teammates could manage double digit score as West Indies eventually folded for 101 in 17.4 overs. Opening the attack for Sri Lanka, Mathews emerged as the man with the golden arm with every second ball of his first over managing a deflection before crashing into the stumps. Xavier Marshall's tentative bottom edge brought his peril, Lendl Simmons lost his leg stump after the ball had clipped his thigh pad and Dwayne Bravo became the third scoreless batsman, caught in two minds whether to play or leave before dragging it onto his stumps. Dilshan, the Man of the Match: I wanted to keep going and always knew that 140 would be a good total, I was batting accordingly. I have been in some great form for the last few months, I wanted to make the most of it. Sangakkara: Dilshan has been a pioneer of stroke-making here in this World Cup, he has matured a lot as player. Matthews bowled really well, it was a great team effort. We expected the pitch to be a lot better, it was slow but it was good for our spinners. Three wickets in the first over and then having Murali and Mendis to bowl always helps. We just want to be responsible and perform our roles well. Gayle: I am very disappointed. Dilshan took the game away from us and then their bowlers were right there from the start. We didn't bowl badly, we started well actually. The first over where we lost three wickets hurt us, we didn't get the start with the bat. It's a good learning experience. Earlier, Tillakartne Dilshan's memorable tournament continued as he produced an almost single-handed display to give Sri Lanka a total to defend at The Oval. 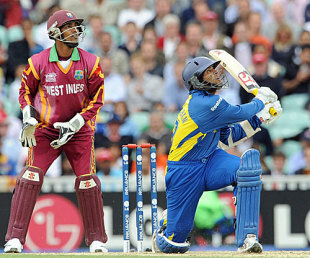 While his team-mates struggled to find much momentum, Dilshan batted through the innings to hit an unbeaten 96 off 57 balls, the highest score of the event, as Sri Lanka reached 158 for 5. Brief Score: Sri Lanka 158 for 5 (Dilshan 96*) Beat West Indies (Chris Gayle 63*, AD Mathews 3-16, M Muralitharan 3-29) by 57-runs.